Do you meet your state's minimum residency requirement for divorce? Does your state require you to wait for a certain amount of time before filing for or finalizing a divorce? Does your state require you and your spouse to live at separate residences for a set amount of time before getting divorced? What's the difference between a waiting period and a separation requirement? A mandatory waiting period, also commonly referred to as a "cooling off period," is the amount of time that must pass before your divorce can be filed or, in some states, before it can be finalized. Not all states have cooling off periods, but in those that do, it generally begins to run either as soon as the divorce is filed or once your spouse is served with divorce papers. A separation period, on the other hand, is the amount of time that the spouses must be separated before getting a divorce. In some states, the separation period must be met before the divorce can be filed, while in others, it just needs to be met before the divorce can be finalized. The chart below indicates which states have waiting periods and/or separation requirements. As a practical matter, the point of waiting periods and separation requirements is the same - to give couples an opportunity to rethink the decision to end their marriages before it's too late. Usually, yes. As mentioned above, not all states have a separation requirement and in many that do, the separation date is simply the date that at least one of you decided the marriage was over and stopped living like a couple, even if you still live together. However, in other states, primarily in the Southeast, the spouses are required to live at separate residences for a set amount of time before the divorce can be filed or finalized. In these states, the separation requirements range from 6-18 months, and in addition to living at separate residences, being separated usually also means not engaging in sexual relations with your spouse during that time. As is the case with waiting periods (see below), some states increase the separation requirement when the parties have minor children. In Louisiana and Virginia, for example, the separation requirement doubles - from six months to one year - when the parties have minor children together. See: Can You Get Divorced While Living Together for separation requirements for each state. Is there a mandatory waiting period before we can get a divorce? In the states that have one, the mandatory waiting period usually ranges from 30-90 days, although even in states that don't have a mandatory waiting period, it may still take that long to finalize the divorce because the judge's schedule controls how quickly your case proceeds. Among other things, your state may require a divorce hearing, and even if it doesn't, your case likely has many others in front of it waiting to be finalized. Generally though, courts administer uncontested divorce cases quickly when the proper paperwork is filed in a timely manner. In some states, mandatory waiting periods are longer when the parties have minor children together, the theory being that there are benefits when children are able to grow up in a household with both parents and for that reason, additional time should be given to the decision to end the marriage. When a state does increase the waiting period in divorces with minor children, the difference tends to only be a month or two. Michigan, which enhances the waiting period from two months to six months when the parties have minor children, is a noteworthy exception to this. A mandatory waiting period should not be confused with the time allotted for the non-filing spouse to respond to, or "answer" the divorce papers. While mandatory waiting periods are designed to preserve marriages by giving couples time to rethink divorce, the time for answering gives the non-filing spouse a certain amount of time (usually 20-60 days) to file an Answer and/or hire an attorney, if he or she does not agree with the divorce and/or the terms requested by the filing spouse in the divorce petition. While the mandatory waiting period cannot generally be waived in most states, the non-filing spouse can usually shorten or even eliminate the answer period by filing the right documents. You must wait 30 days after filing to finalize your divorce. Also, neither spouse is allowed to remarry except to each other until 60 days after the divorce is finalized. You must wait 30 days filing to finalize your divorce. You must wait 60 days after your spouse is served with divorce papers to finalize the divorce. You must wait 6 months +1 day after the date your spouse was served with divorce papers to finalize your divorce. You must wait 90 days from the date the divorce was filed or the date your spouse was served, whichever comes later, to finalize your divorce. After you file for divorce, the papers are served on your spouse and then returned to the Court. The 90-day waiting period begins to run on the day the papers are returned, also known as the "return date." You must wait 30 days unless you and your spouse file a waiver of the 30-day waiting period. You must wait 20 days from the date the divorce is filed. You must wait 20 days after service on your spouse before the divorce can be finalized. You must wait 60 days after filing to finalize your divorce. You must wait 90 days from the date the non-filing spouse's Acceptance of Service is filed to finalize your divorce. No children: You must wait 30 days from the date of filing as long as the 60-day separation requirement is met. With children: You must wait 60 days from the date of filing even if the separation requirement is already met. You must wait 60 days after filing for divorce before you can have your divorce hearing. The hearing date is usually mailed to you 2-4 weeks after filing for divorce. Thirty days after the hearing, a Rule Nisi Divorce Judgment is entered, but the Final Judgment is not signed by the Judge until 90 days after that. You must wait 60 days from the filing date if you have no minor children together. If you have minor children together, you must wait 180 days from the filing date. You must wait 30 days from the date the divorce is filed. You must wait 20 days from the date the divorce was filed to have your divorce hearing. The judge cannot sign your Decree until 60 days after your spouse is either served or signs a Voluntary Appearance. Then, the divorce is finalized 30 days after the Decree is signed by the judge. The First Appearance session will usually occur within 30 days of the divorce being filed. The spouses should receive a copy of the Final Decree signed by the judge within 30 days after the First Appearance. The grounds for no-fault divorce require the couple to experience 180 days of irreconcilable differences before the divorce can be filed. The grounds for no-fault divorce require that the relationship between the spouses has broken down irretrievably for a period of at least six months before the divorce can be filed. The grounds for no-fault divorce require the spouses to be separated for a year before the divorce can be finalized. The separation period can begin before the divorce is filed. For dissolutions, the final hearing is held between 30 and 90 days after the date the papers were filed. For divorces, the hearing is usually scheduled within the same time frame. You must wait 90 days from the date the Respondent's Waiver of Summons and Entry of Appearance is filed if you have minor children together. If you do not have minor children together, there is no mandatory waiting period. The 90-day waiting period was abolished in 2012. You must wait 90 days from the date the divorce was filed to finalize your divorce. The hearing to finalize the divorce cannot be held sooner than 60 days from the date the divorce was filed. The divorce is finalized 90 days after the judge signs the Final Judgment at the hearing. You must live separate and apart without sexual relations for a period of one (1) year before filing for divorce. There is a 60-day waiting period from the date your spouse is served with divorce papers. The hearing to finalize the divorce must be held at least 60 days/90 days with children from the date the divorce was filed. The hearing to finalize the divorce must be scheduled at least 61 days after the divorce was filed. You must wait 30 days from the date the divorce was filed. The hearing to finalize the divorce must be held no sooner than 20 days and no later than 220 days from the date the divorce was filed. You must wait 120 days after your spouse is served with divorce papers. You must wait at least 20 days after your spouse has been served with divorce papers before the divorce can be finalized. Is there anything I can do to speed things up? In most states you have no choice, but to wait out the state's residency requirements as well as any separation and/or cooling off periods. However, some states do allow people to seek a waiver of the cooling off period. Some waivers are granted when both spouses to agree while others generally must be for "good cause." For example, Iowa, which has a 90-day waiting period, has a procedure for asking the court to waive this requirement. However, the judge generally only grants a waiver for good cause, which generally means that the waiver is necessary to protect the rights or interests of one or both spouses or the minor children. 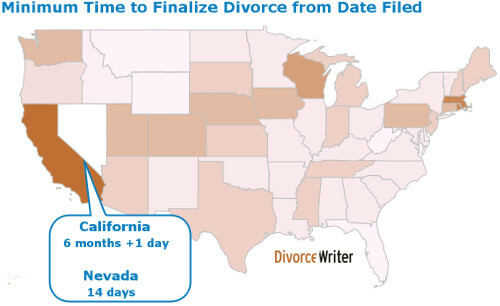 If you file for divorce using documents you prepared online with DivorceWriter, you will receive any forms available to reduce the length of time to finalize your divorce in your state. DivorceWriter also includes step-by-step filing procedures with state-specific tips for completing your divorce as quickly as possible.